Review by AllTheBestFights.com: 2018-02-03, pretty good fight between Michel Prazeres and Desmond Green: it gets three stars. The black belt in Bjj Michel Prazeres entered this fight with a professional record of 23-2-0 (48% finishing rate) and he is ranked as the No.27 lightweight in the world. ‘Trator’ Prazeres suffered his last loss when he faced Kevin Lee in 2015 (=Prazeres vs Lee), since then he has won five bouts beating Josh Burkman and Mads Burnell in 2017. His opponent, Desmond Green, has a mma record of 20-6-0 (30% finishing rate) and he entered as the No.64 in the same weight class. He fought twice last year defeating Josh Emmett and losing to Rustam Khabilov (=Khabilov vs Green). Prazeres vs Green is on the undercard of Lyoto Machida vs Eryk Anders – UFC Fight Night 125. Watch the video and rate this fight! Review by AllTheBestFights.com: 2018-02-03, pretty boring fight between Lyoto Machida and Eryk Anders: it gets two stars. The black belt in karate, Bjj and former Ufc light-hw champion Lyoto Machida entered this fight with a professional mma record of 22-8-0 (50% finishing rate) and he is ranked as the No.40 middleweight in the world but he lost four out of his last five bouts, the last three with Luke Rockhold (=Machida vs Rockhold), Yoel Romero (=Machida vs Romero) and Derek Brunson (=Brunson vs Machida). His opponent, the undefeated Eryk Anders, has a perfect record of 10-0-0 (70% finishing rate) and he entered as the No.34 in the same weight class. He fought four times last year winning over Jon Kirk, Brendan Allen, Rafael Natal and Markus Perez Echeimberg (=Anders vs Perez Echeimberg). Machida vs Anders is the main event of the UFC Fight Night 125. Watch the video and rate this fight! Review by AllTheBestFights.com: 2018-02-03, one sided fight between Valentina Shevchenko and Priscila Cachoeira: it gets two stars (UFC Performance of the Night). The black belt in tae-kwon-do, judo and former Wako, Wmf and Kunlun fight kickboxing champion Valentina Shevchenko entered this fight with a mma record of 14-3-0 (71% finishing rate) and she is ranked as the No.2 women’s bantamweight in the world. She fought twice last year beating Julianna Pena (=Shevchenko vs Pena) and losing to current #1 Ufc women’s Bw champion Amanda Nunes (=Nunes vs Shevchenko 2). Her opponent, the undefeated Priscila Cachoeira, has a perfect record of 8-0-0 (50% ko/tko victory rate – she has never won via submission) and she entered as the No.9 women’s flyweight. ‘Pedrita’ Cachoeira fought four times in 2017 winning over Laisa Coimbra, Karoline Martins Moreira, Marta Souza and Rosy Duarte. Shevchenko vs Cachoeira is on the undercard of Lyoto Machida vs Eryk Anders – UFC Fight Night 125. Watch the video and rate this fight! Review by AllTheBestFights.com: 2018-02-03, fight not particularly good between Timothy Johnson and Marcelo Golm: it gets two stars. Timothy Johnson entered this fight with a pro record of 11-4-0 (82% finishing rate) and he is ranked as the No.33 heavyweight in the world but he lost three out of his last five bouts, the last one with Junior Albini. His opponent, the undefeated Marcelo Golm, has an official mma record of 6-0-0 (100% finishing rate) and he fought three times in 2017 winning over Italo Marques, Nicolas Oliveira and Christian Colombo. Johnson vs Golm is on the undercard of Lyoto Machida vs Eryk Anders – UFC Fight Night 125. Watch the video and rate this fight! Review by AllTheBestFights.com: 2018-02-03, nice and tough fight between Thiago Santos and Anthony Smith: it gets three stars (UFC Fight of the Night). Thiago Santos entered this fight with a record of 16-5-0 (75% finishing rate) and he is ranked as the No.20 middleweight in the world. Thiago ‘Marreta’ lost twice in 2016, against Gegard Mousasi (=Mousasi vs Santos ) and Eric Spicely, but then he has won over Jack Marshman (=Santos vs Marshman), Gerald Meerschaert and Jack Hermansson (=Santos vs Hermansson). His opponent, Anthony Smith, has a mma record of 28-12-0 (89% finishing rate) and he entered as the No.28 in the same weight class. He also lost in 2016, against Cezar Ferreira, but then he has beat Elvis Mutapcic, Andrew Sanchez and Hector Lombard (=Lombard vs Smith). 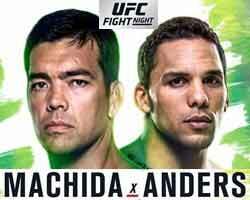 Santos vs Smith is on the undercard of Lyoto Machida vs Eryk Anders – UFC Fight Night 125. Watch the video and rate this fight! Review by AllTheBestFights.com: 2018-02-03, some good exchanges between Deiveson Figueiredo and Joseph Morales but it is not enough to get three stars: it gets two. Both undefeated, the Brazilian Deiveson Figueiredo entered this fight with a perfect mma record of 13-0-0 (85% finishing rate) and he is ranked as the No.14 flyweight in the world while his opponent, Joseph Morales, has an official record of 9-0-0 (78% finishing rate) and he entered as the No.24 in the same weight class. Both fighters fought twice last year: ‘Daico’ Figueiredo beat Marco Beltran and Jarred Brooks (=Figueiredo vs Brooks) while Morales defeated Sean Santella and Roberto Sanchez. 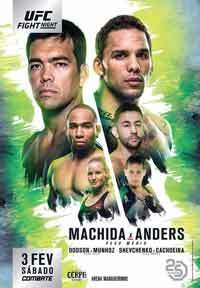 Figueiredo vs Morales is on the undercard of Lyoto Machida vs Eryk Anders – UFC Fight Night 125. Watch the video and rate this fight!